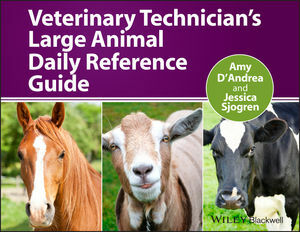 Veterinary Technician’s Large Animal Daily Reference Guide is an indispensible resource in daily clinical practice. Covering all aspects of a veterinary technician’s responsibilities in the care of large animals, the book provides fast access to practical information, aiding newly trained and skilled large animal technicians alike in performing their daily tasks. Designed as a quick yet comprehensive reference, the tables and charts throughout offer reliable, easy-to-follow information on horses, cattle, small ruminants, and pigs. With chapter topics ranging from anatomy and nutrition to emergency and critical care, the book’s coverage includes both the basics of veterinary care and more specialized nursing procedures. Veterinary Technician’s Large Animal Daily Reference Guide is an invaluable tool for any veterinary technician working with large animals, as well as veterinary technology students seeking more information on these species. Amy D'Andrea, BS, MEd, CVT, VTS (EVN), is an instructor at the New England Institute of Technology Veterinary Technology Program in Warwick, Rhode Island, USA. Jessica Sjogren, BS in Veterinary Technology, CEST, is an emergency technologist at VCA South Shore Animal Hospital in South Weymouth, Massachusetts, USA.